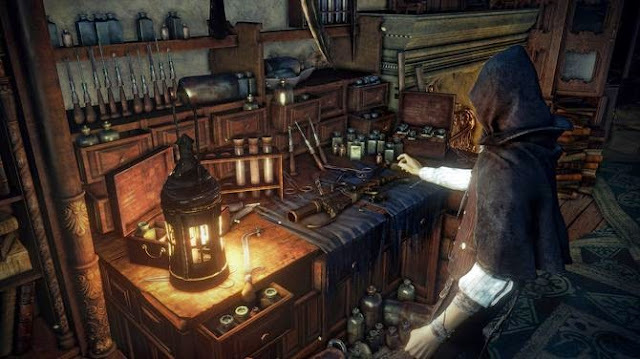 Bloodborne is probably the most accessible offshoot of the "Souls" series. Nevertheless, it falls some newcomers certainly hard to master the multiplayer mode. Here you can find out how you get yourself helpful hunters into the boat, hurry them to help themselves or their penetrating into other worlds and other hunters make life difficult. IMPORTANT ! : In order to be able to find a partner you have to select it at the start of the game's online mode. If you are offline and the bell rings, you will wait in vain for help. You need just three items in order to obtain access to the various forms of multiplayer. The first object you get in the "dream of the Hunter", right after the first encounter with the cleric-beast . On the staircase that leads you into the small little house, you can see some of the messengers on the floor. Here you get the challenge bell and a silencer. To come into the possession of small reverberant bell and the dark echoing bell, you must first collect ten insights. This you will receive by bosses you have encountered this defeated or consumed the item knowledge of the Insane. Once you have collected at least ten insights, it returns to the dream of the hunter. The top of the small little house you go to the left, the door, thus activating a second trader. This insight is your currency to buy new items as well as the other two bells for each access point a. In Bloodborne there is no shame in a foreign player to ask for help. On the contrary: in boss fights her reaching for every helping hand, you can earn. Press the right side of the touchpad button of your controller and stay there, the challenge bell in your "Personal Items". If you have always quickly access to the bell. In addition, you can see if you can invite ever in your world another hunter. If the icon is gray, you are in an area where any distress call is ignored. Tip: Especially in the area of boss fights, fighter offers his help. Before you step through the fog, you should ring the bell. But be warned while you are waiting for a co-op partner, another -.! Players enter your world and challenge you - to riot brushed. After ringing the bell challenge, it looks for a teammate. This process usually takes a few seconds to a few minutes. So be patient. To cancel the search, it simply uses the muffler. The bell is silent and you continue your path alone. In other games sent invitations, Bloodborne you need for a password. Follow the below steps to start the process. 2. Clicking in the inventory on "System" and then click "Network"
3. To specify the region of "local" to "Worldwide"
4. Now, you think to yourself from a password. Do not make it too complicated, because your partner must enter exactly the same. You find yourselves at about the same place; you will soon compete together against the dark creatures. If you have problems with the connection, look at your level. If the difference is too big, you will probably rarely find each other. According to the developers, a maximum level difference of ten should exist between you and your friend. The third option is the invading alien worlds (PvP). Do you want to play the evil and annoy a foreign hunter, use for this purpose after lightening the dark bell. Will be teleported soon in another world. Seeking your enemies and challenge him to a duel. Of course you can also be the victim of an "invasion". As we have already mentioned, other players can enter into your world, if you're looking for a helper. You will receive no message or no signal when this happens. So be always on the alert and keep an eye out for danger.